The Main window is used to give you an overview of the basic power system, namely how many batteries and photovoltaic panels are needed. 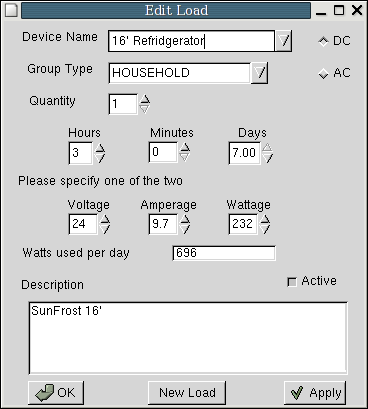 You can also select a few other components like inverters and charge contollers to get a rough idea of the total system cost. 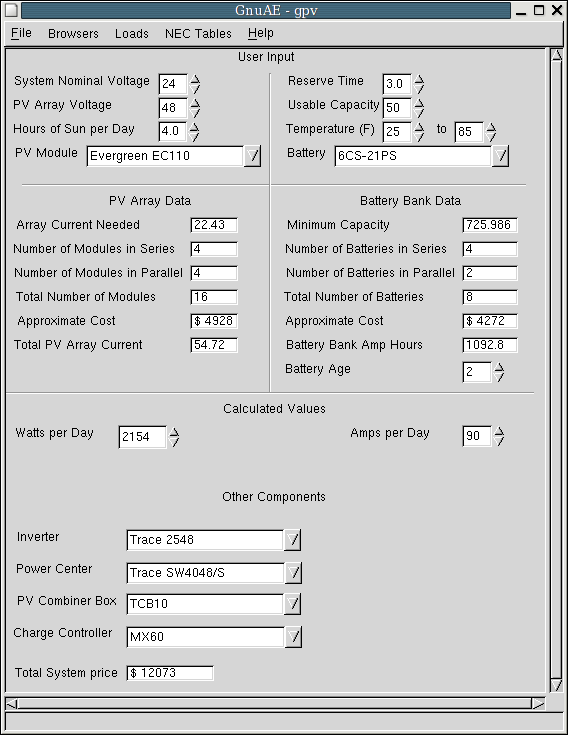 All the values for the quantity of photovoltaic panels, batteries, etc... are calculated based on the system loads. This is the main window for GnuAE. The only value that get adjusted in this window are the top 4 rows. The System Nominal Voltage is the voltage of the system (the battery bank). This is usually 12 or 24 volts. The PV array voltage is the total voltage of all the panels wired together. 13, 24, or 48 volts is common, with 48 volts for longer runs of wire. Hours of Sun per Day is how much sun the array will get in the winter. 5 hours is common in much of the US. A future feature for GnuAE will be adding the weatheer charts for the last 30 years. DPV Module is of course, which PV module you prefer. The Reserve Time is how many days of no sun do you want to have power at your normal level of activity ? Around here we get these 4-5 day long overcast storms, but get by on 3 days reserve because we just conserve power during those times. (less loads of laundry) The Usable Capacity is how low do you plan to deplete your batteries ? 50% is a healthy number, 60% is common. The Temperature is also important. One thing that spawned the creation of GnuAE was the lack of temperature compensation in any of the existing software tools. When you live in a cold weather climate, this becomes very important as batteries below 41F start to loose alot of their efficiency. What this means to you is you have less power during cold weather than in warm weather. Around here, where my power shed (which is now heated) would get to -35F, and especially with my ancient L16s, there was just barely enough power to do anything but run light bulbs. Warm weather has the same effect. This window details the wiring needed for any alternate energy system. This later becomes part of the generated parts list. In this caes, all ampacity, overcurrent, and all other NEC calculations are done. Any fuzzy issues are resolved towards the extra safe side. This window displays the sizes of the wires needed. The sizes of your wires is critical to the safety of any power system. The current carrying capacity of the wires during temperature extremes is very important. Wires run in a conduit or other enclosed space get warm, and as the temperature rises, the efficiency of the wires goes down, as well as the maximum current carrying capacity. Especially with low-power DC systems (12 or 24 VDC), voltage loss is also important, and this limits the length of wires. All the calculations take into account the possible temperatures, as well as current carrying capacity. All the data for this is specified in the NEC Code, but spread out over a couple of different tables. Here is where you choose loads, and how much you use them. This is an important part of sizing a systems, as your idea of the loads is used for all other calculations. This window is for adjusting the system loads. This is where all the values for how much power you will be using get entered. All of the power consumption is from my own tests with a power meter. Additional database entries will always be appreciated. The important data is the amount of time the device will be used. Calculations are based on full weeks, since many devices aren't used every day. The Watts used per day is how much the device will use for the amount of time specified. You can also enter in the data, but by toggling the Active button, you can turn off whether this device is used for calculations or not. This is so you can experiment with different configurations. The description isn't used for anything but additional information. To add a new load, click the New Load button, and then enter the data. 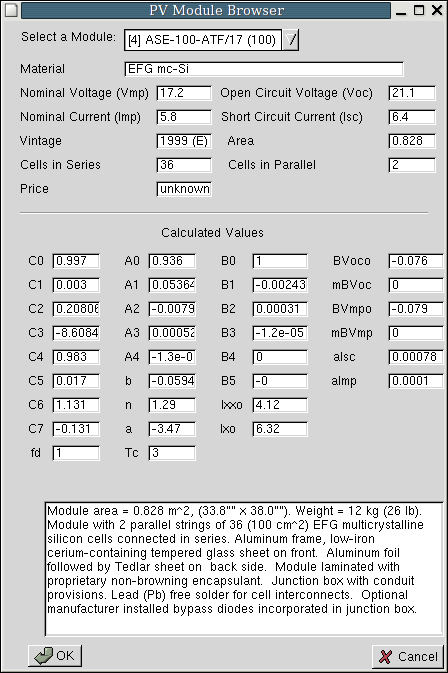 The NEC calculator is used to evaluate Voltage Drop issues, which are very important in low power DC systems. You can also specify the number of condctors. 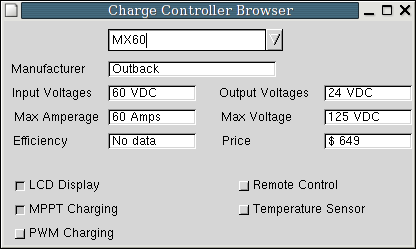 This window lets you browse the database of charge controllers. 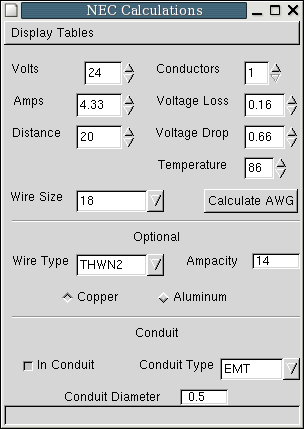 The various features for the controllers is displayed, along with the electrical characteristics. This window displays all the data on photovoltaic panels in the database. All the Calculated Values currently come from the Sandia National Labs database from their testbed, and monitored installations. The original motivation for GnuAE was to bring these database of real performance data back to life. Future releases of GnuAE will be able to calculate the values from anyone's sensors, and add to the database, which does not have any newer panels. 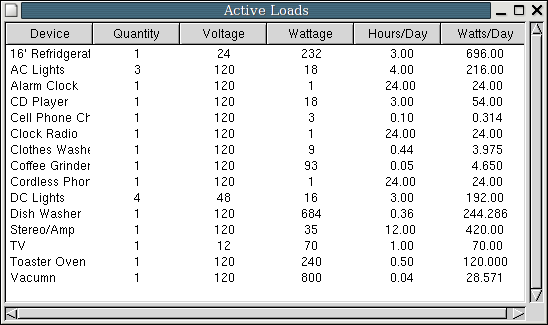 The data values are used by the main window for calculating how many panels are needed. This window displays the list of active devices, and their power consumption. This is so you can view your current profile. 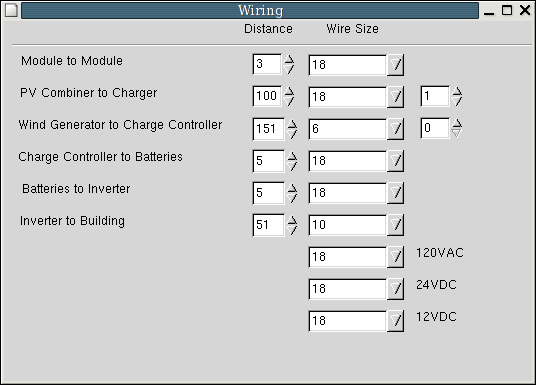 This window displays the database of inverters, and their basic features. This window display the database of batteries, and their electrical characteristics.